At the height of the disco rage, novelty songs were all around. I described one of them on this blog: Rick Dees and his 'Disco Duck'. And this is another one: 'King Kong', a song about the movie gorilla of the same name. Bobby Pickett had a hit in 1962 with another novelty song, 'Monster Mash', a number one hit in America. Pickett proceeded to make further novelty songs, such as 'Star Drek' (about the television series 'Star Trek') and this one. 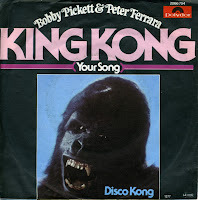 Based firmly on the story of the movie 'King Kong', Pickett and Ferrara perform the various voices on this track. The single was released in 1976, but didn't become a hit.